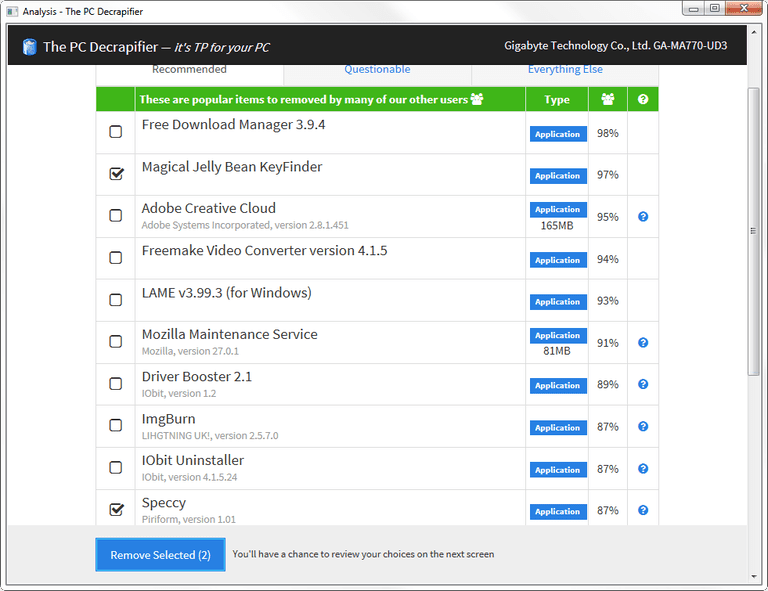 PC Decrapifier is a software uninstaller that's portable, very simple to use, and supports batch uninstalls. PC Decrapifier specializes in the removal of those preinstalled and often never-used programs that come with new PCs, which are also known as bloatware, crapware, junkware, and shovelware, but it is not limited to the removal of these types of programs. PC Decrapifier can scan and list all programs you have on your system that you might want to remove, and it can remove some programs automatically so you don't even have to click through an uninstall wizard. PC Decrapifier is free to download for Windows 10, Windows 8, Windows 7, Windows XP, and Windows 2000. Walks you through a wizard so you can easily see which programs it recommends removing, can be removed automatically, and those you can remove manually. Displays a percentage of users who uninstalled each program to help you decide whether you, too, should uninstall it. Categorizes programs it can uninstall in Recommended, Questionable, and Everything Else tabs. Shows how much space programs take up on your hard drive. PC Decrapifier is a very simple program, which is a great benefit if you just want to get rid of useless software quickly and without a lot of technical considerations. Those who want more control over the removal of programs may find it too automated. Completely portable (doesn't need to be installed). Takes up less than 2 MB of hard drive space. Can uninstall programs in bulk. Can remove some programs automatically without a lot of user action. Prompts the user to create a restore point before uninstalling software; this is a recommended step just in case you remove a program and encounter issues. Can't filter through the list of programs. Can't search for a program from the list. No option to remove a program's entry from the list of software. No right-click context menu option for removing programs in Windows Explorer. PC Decrapifier focuses on removing programs that come preinstalled on newly purchased computers. Many of these preinstalled programs can be removed quickly and automatically with PC Decrapifier so you don't have to spend a lot of time clicking through prompts, which would otherwise be the case if you were to remove each individually on your own. While testing PC Decrapifier, it removed two programs consecutively without any prompting, and these programs were not preinstalled to the test computer. This means the automatic feature works not just for those preinstalled manufacturer programs, but also those you might install yourself. If you purchase a new computer from a retail store, downloading and running PC Decrapifier as one of your first actions (in addition to setting up a good antivirus application) can give your new system a fresh and uncluttered start free of software junk. And if you have had your computer for a while, you can benefit from letting PC Decrapifier scan your system and suggest the removal of programs you may not need (and may not even have realized were installed and taking up space! ).